After reading All Creatures Great and Small by James Herriot in kindergarten, Dr. Rebecca Juvenal knew she wanted to be a veterinarian. 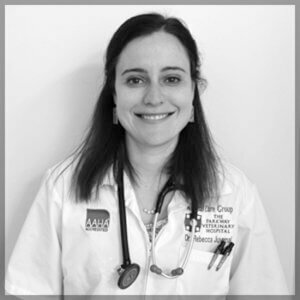 She received her doctorate from the University of Missouri, and she started her career with an emphasis in emergency medicine, later transitioning to general practice to focus on preventative care. In her free time, she enjoys gardening, backpacking, gourmet cooking, reading fiction and scuba diving. Dr. Juvenal lives with her husband, Casey, their two cats, Pippa and Monti, and their labradoodle, Otis.